Im about to remove my clutch as I have (most likely) a leaking main seal. I need some bolts and nuts for a clutch removal/release tool, but Im getting a little confused about the bolt size. Some say M8x50 with 1.25 pitch, others say M8x50 with 1.0 pitch, but the stretch bolt I took form my clutch is M7. Whats up with that? 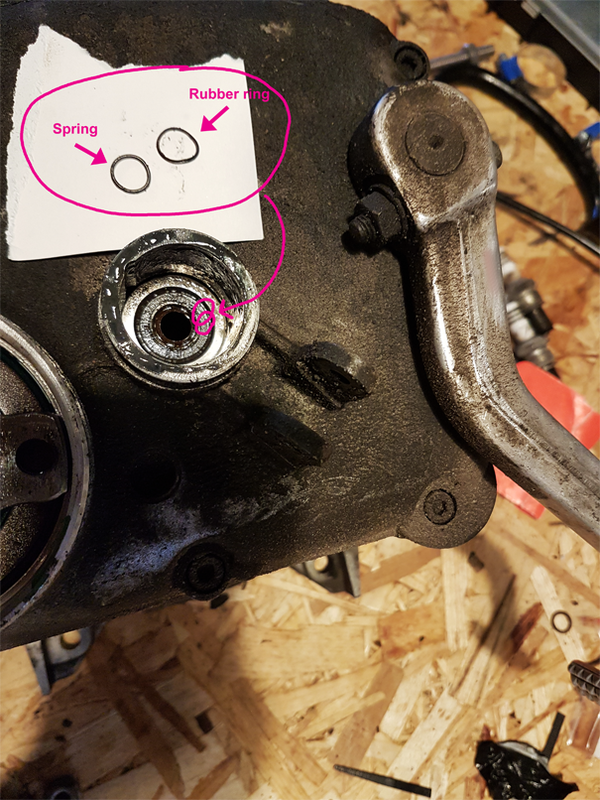 What bolt size do I need for let down bolts, on a 1983 R65? I just checked the bolts that I have, they measure at 7 mm diameter . Can't access my tap and die set, so i can't give you a thread pitch . you do not need the bolts to release the clutch pressure plate on that year, they are only needed on the original heavy flywheel bikes. I was wondering if he had a pre or post 1981 bike. So I can just criss cross loosen the 6 bolts, without the clutch blowing up in my face? If it is the later "clutch carrier" type rather than the older "heavy flywheel' type - Yep, you sure can. A tip, the components of the clutch "pack" are all individually balanced and at the factory the components were matched up. A daub of white paint was applied by the factory to record how each "pack" went together. That white paint will most likely have disappeared by now, do yourself a huge favour and mark the components before disassemble so that you can put it back together the same way. do you have the required tools to pull the rear seal and the tool to fit the new seal. take note of the depth of the old seal before you pull it out , a slide hammer can assist in removing the old seal. they can be a little stubborn to get out and it is important to not mark the surrounding metal as it could effect the quality of the crank sealing. Good advice given re noting the paint marks on clutch and ring gear components, they have best balance if the paint marks are duly noted and reinstalled in the same configuration. Good Luck it is not a particularly difficult job but requires care at every step ... ___Make sure you block the crank from shifting forward before starting any of the removals ___!!!!!!! Yeah, me too - not my smartest moment deciding to spray them down with brake cleaner. Fortunately was able to discern just enough paint remaining to work it out - now marked by centrepunch. Yes absolutely to blocking the crank, on my shelf is an R100 engine that the person who worked on it did not block the crank. They also failed to notice that the engine was a bit tight and they managed to start it. The results are tragic. The easiest way to get the rear seal out is to screw some "tek screws" (also known as self tapping screws) and then use a claw hammer and big screwdriver to leaver out the old seal. With the new seal and a late model engine there is no need to measure the installed depth of the rear main seal - but you really should use the correct tool to drive it home. If you take the flywheel off, open the oil pump and inspect the gears as a matter of course, new o-ring of course. Last thing you may need to know. You have taken out the flywheel bolts and removed the flywheel. You now face that strange little inner device that mounts onto the end of the crank. It needs to come out so you can get the main seal (and it will need a new o-ring too) but the means of getting the little bugger out are not immediately clear. Courtesy of it being soaked constantly in oil it will strongly resist simply being pulled off - use a screw driver and light hammer on the edge of one of the holes the bolts go through and tap it around in a circle - half a turn is usually enough to break the suction and it will pull off easily. Because there is a small possibility that you will raise an edge when you used the screw driver - use a stone to ensure the area around the bolt holes is perfectly flat. Thanks guys, Im soaking up every bit of information. Tommorow I am going to cut down a 6mm allen wrench and make a piece that can push agains the front engine cover and keep the crank from shifting forward. Those are remnants of the clutch pushed oil seal . It can not have entered the transmission as the pushed runs thru the transmission in a hollow shaft.. No worries ,just purchase a new pushed oil seal. There should be more of that seal still in the back transmission casting.